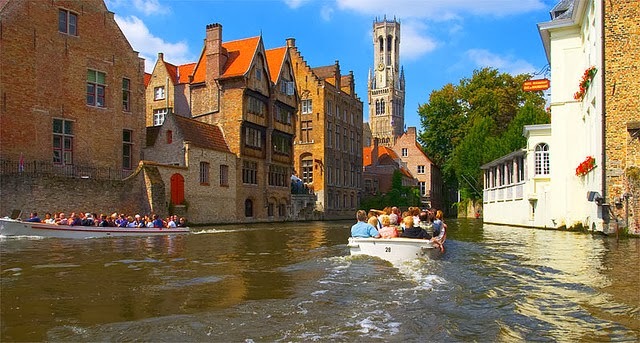 Bruges (Brugge in Dutch, the local language in Flanders) is one of the most beautiful towns on the planet. 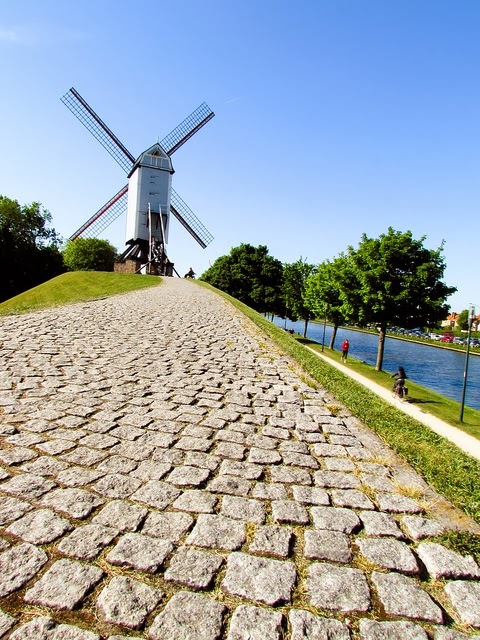 Its unique mix of medieval buildings, canals spanned by old stone bridges, gate-towers, windmills, rich merchants' homes, impressive churches and long riverside parks make it one of the most fascinating places you'll ever go. And the trails along the river and canals also make for some great runs. 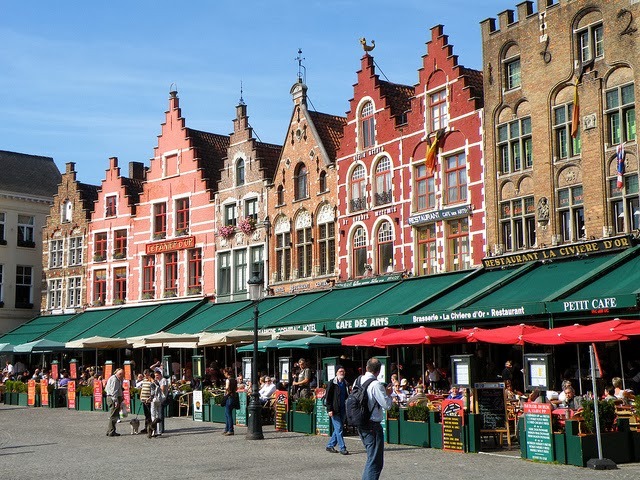 Bruges' medieval old-town is a UNESCO World Heritage Site, and as soon as you see it, you'll understand why. In the middle-ages, the town became very wealthy by weaving cloth and lace, and trading in spices and textiles. It was one of the wealthiest members of the Hanseatic League. And its rich merchants built a stunning collection of private and public buildings within the old city walls. I was absolutely bowled over by it, the first time I visited. And that fascination hasn't diminished a bit with time. So, if you're lucky enough to spend some time in this great old town, let's do a run along (in my humble opinion) the best route around, combining the riverside, some canals and the most interesting sights in the old town. We'll start the run at the 700-year-old Church of Our Lady (Onze-Lieve-Vrouwekerk in Dutch), with its collection of art treasures, including one statue by Michelangelo. At the street-corner, near the church tower, turn south and start running down Mariastraat. 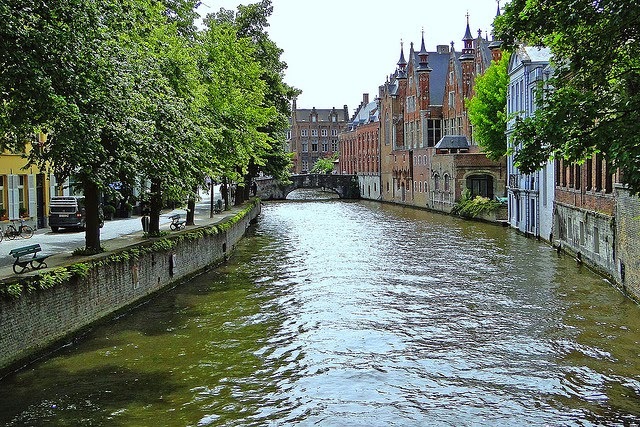 You'll quickly pass another church on the right side, Sint Jan, and then run over the first beautiful canal view. Keep running south for two more blocks along this narrow shopping street, then turn right into Walstraat. Run just one block to the first tree-filled square, Walplein, and turn left. At the next crossing, Wijngaardstraat, turn right, heading into the next little square, lining a canal, the Minnewater. Here you cross the bridge over the canal and head straight through the little gate-house into an amazing little neighborhood, the Begijnhof. You find yourself in a peaceful, tree-filled square lined by old white houses. 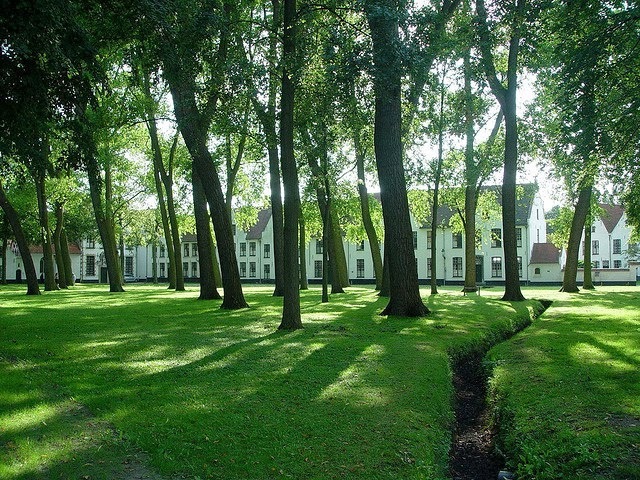 Almost every town in the lowlands has a Begijnhof: a lay society of Christian women who live like nuns but are not bound by vows. The benches seem to beckon to sit down for a minute, an afternoon or a lifetime. Circle the square around to the left side, then exit to the south, following the stone path past the church. You'll see a little canal on the left, where you turn left and exit the Begijnhof through its other gate tower, with the battlements on top. You'll come out to the Minnewater again where a cool old brick house, the Sashuis (the sluice-keeper's house), spans the water. Turn right here to continue southwards along the Minnewater, on the dirt path under the trees. There's a house that looks like a little castle across the small lake. At the end of the water, at the one-kilometer mark, you'll come to a remnant of the old city walls, the round gun-powder tower. Now turn left and cross the bridge over the Minnewater and head east along the main canal, the Ghent-to-Ostende Canal. You are now following a footpath in a canal-side park, skirting the old town along the site of the old city walls. You'll run by other old defensive towers and cross over a few side-canals. The trail follows the canal as it slowly curves towards the north. After the 3-km mark, you'll pass the double-towered Kruispoort city gate and then you'll see a series of four old windmills lining the trail up ahead. After the fourth windmill (at the 4-km mark), the canal-side trail ends at Potterierei (Pottery Row). Turn left here. 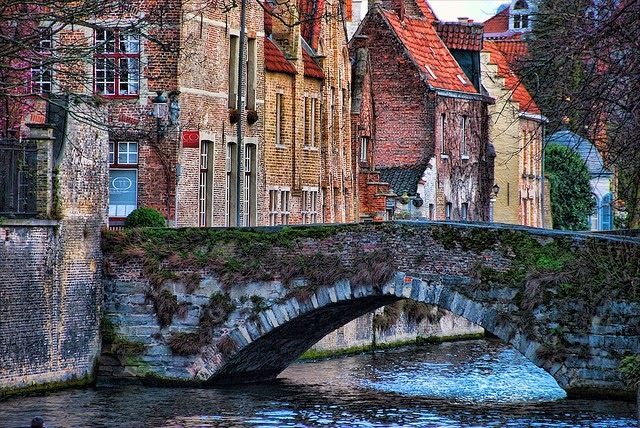 This beautiful street follows a smaller canal as it winds into the heart of the old town. After another kilometer, the canal splits. 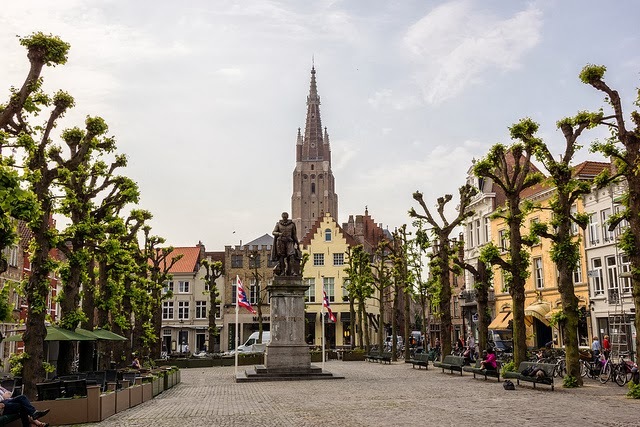 Turn right onto Spinolarei to follow the main section westwards till its end in just three more blocks at the square called Jan Van Eyckplein, with its statue of the great Bruges painter. The square is lined by beautiful merchants' houses. Now cut diagonally through the square to the right and keep running straight west on Academiestraat for one more block. You're now back in the shopping district and increasingly more pedestrians. Turn left onto Vlamingstraat and run past the old theater and shops for a few blocks, straight towards the massive tower of the belfry (bell tower), on the city's main square, the Grote Markt. It's still used as a market on some days, so you might see food stands packed into the square. This is also the 6-km mark. You're now in the heart of town, where there will probably be some crowds to slow you down, but it's worth it to see this part. 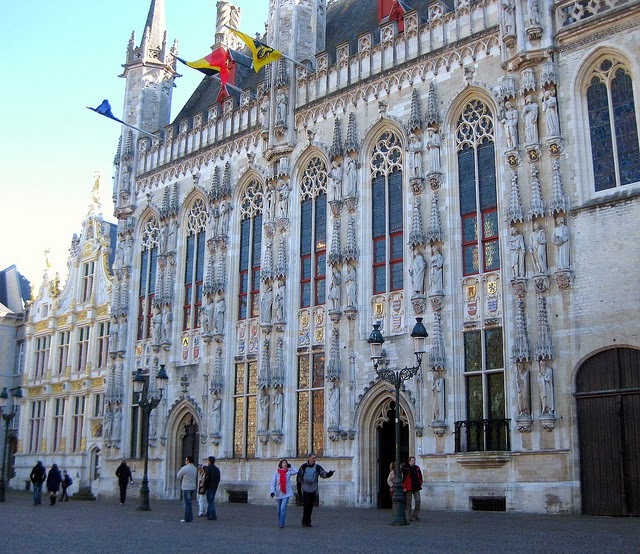 You might as well take a tour of the square and the impressive guild-houses that line each side. The north side, where you entered, is lined by restaurants, where you can get great Belgian meals like steak bearnaise. The statue in the middle of the square depicts Bruges freedom fighters who freed the city from the French. There is a palatial provincial building along the east side. The square is dominated by the huge, 700-year-old belfry. When you get to the belfry, turn left to exit the square to the east along Breidelstraat. In just a few steps you'll come into the next beautiful square, Burgplein (Castle Square), with its collection of amazing buildings. The town hall now occupies the statuary-covered gothic castle, on the right. And the ancient Basilica of the Holy Blood, with its golden statues, sits to its right side. 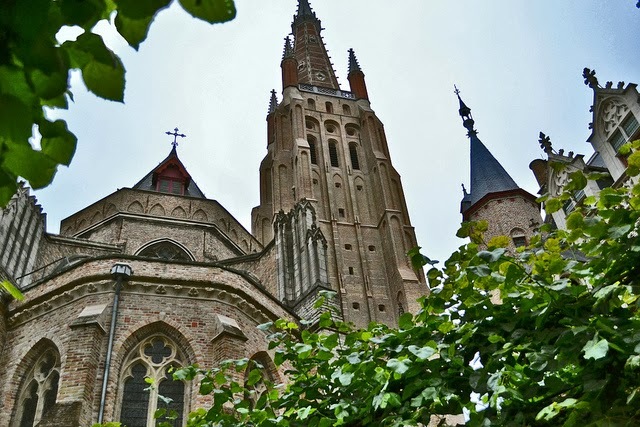 The 900-year-old church houses a relic that is said to contain the blood of Jesus. The little, white "Liberty" mansion is to the left of the town hall. Now keep running northeast along Hoogstraat (High Street) for two blocks until you reach the little lane called Meestraat, where you turn right and run over the bridge spanning the next canal. This is perhaps the most beautiful canal in town, with its trees and footpath, and it's where most of the tourist boats cruise. After the bridge, turn right and follow the canal westwards along Steenhouwersdijk (Stonemasons' Dike). You'll pass the arcaded outdoor fish-market. Follow the path as it goes into the next little square, where you're forced to turn left and then exit the square at a bend in the canal. You are now in the midst of the worst tourist masses, but we're almost done, just a few blocks to go! Turn right onto Rozenhoedkaai and follow the canal on your right side. 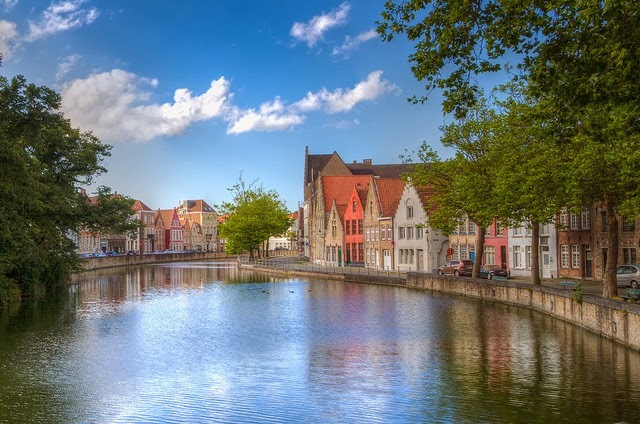 You now have one of the most beautiful views you'll ever see to your right, with the old buildings, churches and the belfry rising above the bend in the canal. I find it hard to not stop and gape at this spot, but you can always come back again later. Now you just keep running southwest along the canal towards the starting point at the tower of the Church of Our Lady, which you can see down the street. The street name changes to Dijver along the way. About the only thing you can say after a run like this: what a beautiful town!